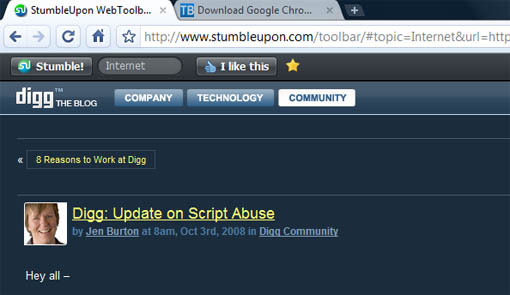 Stumbleupon finally decided to support other browsers like Safari, Opera and Google Chrome apart from IE and Firefox. 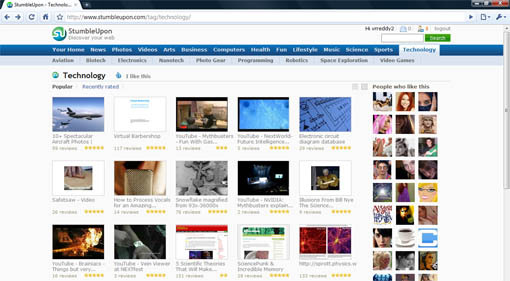 You can stumble sites in any other browser with out any tool bar. Now any one can stumble sites with stumbleupon new interface, you don’t need to register also for stumbling sites but if you want rate sites or review then you need to register for a free account. Visit the stumbleupon home page and start stumbling the sites displayed there, if you prefer to see sites related to a category, select a category from the top menu and go on stumbling. If you like the page you can click the stumble button, there is no ‘dislike’ button at this moment in this version. If you want a review you can click on ‘Rating Stars’ to revies and you can save the site to your favorites using save button. If you are already a registered user, join this beta group to get the new stubleupon interface and features. Once you join this groups you can access all the new features. 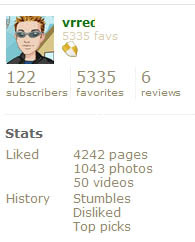 The profile pages of stumblers have changed, now the links to your favorites are aligned just below the main menu. On the right sidebar now profiles have quick stats regarding the stumber. These include subscribers, no of faves, reviews etc. This is gives a quick information about the stumbler you are visiting. Is Stumble still a great place for traffic?